In less than a month my book will be released to the public and I am SO crazy excited about it! I can’t wait to share all of my recipes with you and see what you think. …If you like them… I mean I really, really, really think you will love the recipes, because, boy did I put every ounce of delicious magic I had into this book (delicious magic is totally a thing) but I have to admit, Amazon star rating scares me. Ok, back to not being terrified of Amazon. Today I’m announcing my little book tour and I have a fun surprise for you, I made an infomercial! ← Things I thought I would never do when I grew up. Check out the tour below and find your city. I will be updating this page with any new additions as they come in and the times I will be presenting, so stay tuned! You’re invited! Join me, my family, friends, and the super amazing people from Appetite by Random House at the office of Penguin Random House (in their party room, ya party!) to welcome the arrival of my new book. I seriously can’t wait! Please RSVP to rsvpcanada@penguinrandomhouse.com. This one is for the bloggers. I will be giving a lecture on branding called “How to Stand Out in a Crowd”. Unfortunately, the conference is already sold out, but you can join the waiting list. To find out more about the conference visit the FBC site. (Presentation times TBD). Move over egg and dairy bakers, because this vegan will be prepping 3 sweet treats on stage from my book in a live cooking demo. I actually laughed out loud and was beyond flattered when I saw that the lovely people at Canada’s Baking and Sweets Show listed me as a celebrity on their site! You can find out more info here in the meantime. Join me at noon for a live cooking demo and samples followed by a book signing and high-fives! Just kidding, no high-fives will be involved. I’m a terrible high-fiver. Handshakes or hugs would be prefered. Make sure to check out the Montreal Vegan Festival site for more info. London, Ontario, not London, England… Although if any of you want to invite me to London, England you better believe the answer will be yes! Join me at VegFest London for a cooking demo and samples followed by book signing. The exact time is TBD but you can find out more info here. Want me to come to your city? So do I! If you run or know of a festival or bookstore that would love to have me, I would love to visit. Please feel free to reach out to sam@itdoesnttastelikechicken.com. Now without further ado, my infomercial! I hope you enjoyed watching that as much as I enjoyed making it! 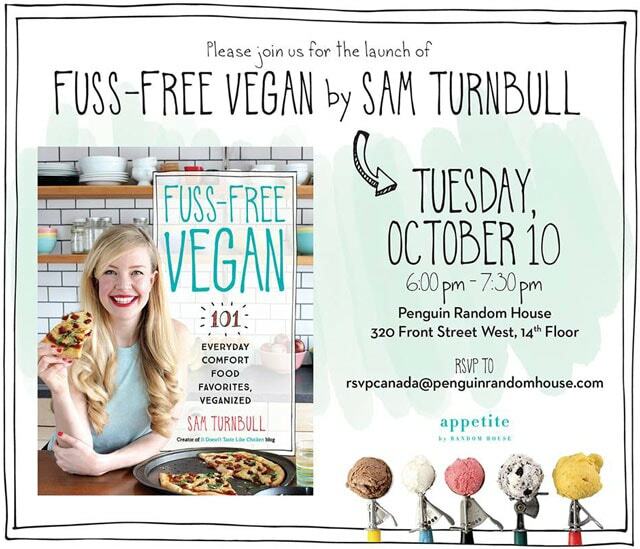 If you haven’t yet, you can preorder Fuss-Free Vegan here. Great video, love that you’re in Toronto. We’re also in that area. I’ve pre-ordered 2 – one for me and one for my daughter for Christmas. That video is hilarious! You and your friends did a great job! And, just FYI, you are such a part of our family that my 4 year old daughter came up to me while watching the video and said, “Look mama, there’s Sam,” hahaha. Are you considering any dates in the US? Only you, Sam!!!! infomercial. Can’t wait for my book. me: do you know this blog It doesn’t taste like chicken? me: damn, this girl is amazing and soooo nice; she replied to my comments twice and liked my pic on insta; omg, it’s like the VIP of vegan world has noticed me! Your infomercial rocks! Going to order your book now! You are so freaking adorable! I love your infomercial! I totally want to be you when I grow up…even though I’m already older than you…but I digress…I’ve preordered your book and can’t wait to get it (been excited since you first announced it was happening!)! I wish you were touring down here in CA, but maybe someday our vegan foodie paths will cross! In the meantime, two big thumbs up on the infomercial and I’ll be sure to leave a glowing Amazon review when I get the book! Your excitement is infectious! I can’t wait. Like Emily, I’ve followed you for almost forever and it’s been so wonderful to witness your journey to full-fledge cookbook author. 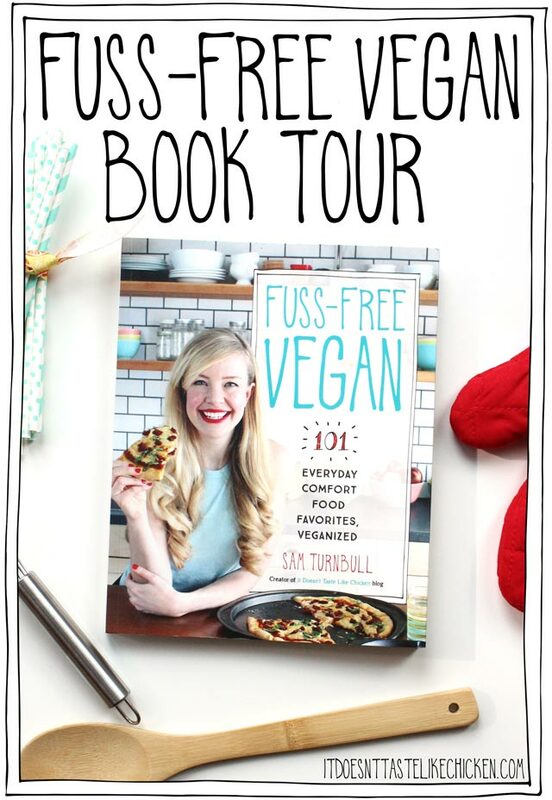 Can’t wait to have my book signed from my favorite vegan food bloggers and recipe creators. Almost as exciting as Christmas (but sooner!). You deserve all this, Sam. AHHHHHhhhhhhh!! – SO Exciting!! (or, maybe it’s the coffee…), Either way, you must be absolutely stoked with anticipation and joy. The best of luck to you! Will it be available here and at Amazon? It would be wonderful if you were able to come to FL to the Vero Beach Book Center, but that’s a huuuge trek, …so this infomercial and knowing you are on this great tour is good enough for me – Cheers!